Roscoe is Pet of the Week! You are here: Home / Pet Corner / Roscoe is Pet of the Week! Roscoe, a gunmetal (perhaps an inspiration for his name) gray-and-white pit bull terrier, looks as if he has something up his sleeve! No doubt it’s his heart, which he proudly wears there. He’s about 6 years old, is extremely calm, and is gentle on the leash. He’s nonreactive to other dogs, even when they bark at him, and is used to other dogs and kids. 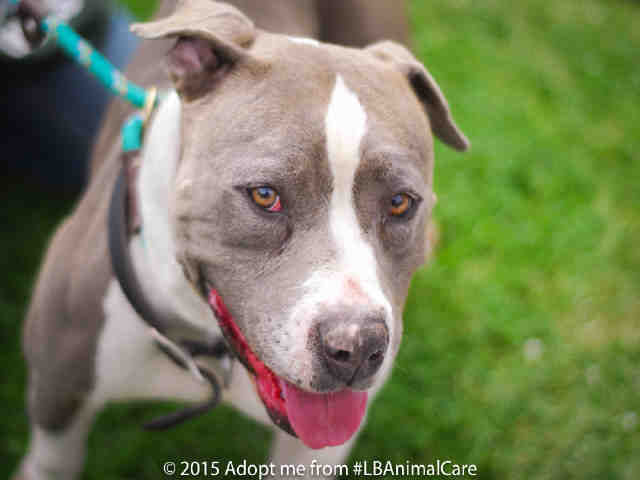 Meet this sweetheart on the shelter side of the Companion Animal Village at 7700 East Spring St., (562) 570-PETS. Ask for ID#A449070.